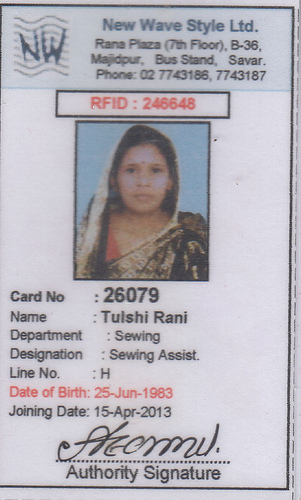 Tulshi Rani, missing at Rana Plaza. Political economy hides completely the estrangement of labor in its real existence in that it does not treat the direct, unmediated relationship between the laborer (labor) and production. Labor produces wonderful works for the rich, but it produces poverty for the worker. It produces palaces, but hovels for the laborer. It produces beauty, but deformity for the laborer. It replaces labor with machines, but at the same time it throws the laborer into the most barbarous labor and at the same time makes the laborer into a machine. It produces intelligence and culture, but it produces senselessness and cretinism for the laborer. I don’t quite understand the economics behind Huq’s claim. He may have spoken hypothetically but the distinct metaphors—chicken feet and a BMW—are themselves indicative of terrible economic disparities. I would like to know more about the magical calculation. Over the last years, the price of rice, lentils and all other basic necessities have skyrocketed. Even the middle class is in hardship, let alone garment workers. As rice queues at fair price outlets got longer and longer, garment workers took to the streets again. In July 2010, the government declared a new minimum wage salary structure. Although the new wages would barely meet workers daily needs, they had expected that factory-owners would implement it as promised. On December 10, 2010, four people were killed, including a riksha driver, when police fired live bullets during worker protests in the Chittagong EPZ (CEPZ). In the same week, a fire broke out in a garment factory of the Ha-meem Group in Savar, leading to the death of twenty three workers. After the EPZ protests in Chittagong, police filed case against thirty thousand workers, while in Dhaka, garment workers leader, Moshrefa Mishu was arrested illegally (without an arrest warrant) from her home. As workers rose up in Narayanganj, Ashulia and Chittagong, as economists, labor rights activists and journalists debated the workers demands for living wages, factory owners denounced these uprisings as a “media exaggeration.” During a regional economic summit in Kathmandu, held in December 2010, Anisul Huq, the chairman of the Mohammadi group of companies, one of the largest apparel manufacturing groups in Bangladesh, claimed “The wage protests were only in two or three factories. It is not a general industry problem. Not even ten factories had a problem. The whole wage issue has been exaggerated by the media (4 January, 2011, Just-style).” I pause, I want to think through his remark. Does this mean he thinks the number of worker deaths over “the wage issue” is too little to be recognized as a general industry problem? From 2006 to 2009, 414 garment workers in Bangladesh died in 213 factory fires (Workers World, December 24, 2010). How can anyone suggest that the struggle of garment workers for safe and secure workplaces is not an industry-wide issue? Angry, I called a labour activist friend in the middle of the night. He laughed loudly, and gave me a list of formulaic responses which factory owners churn out every so often. I am listing them here to help us better understand the statements that factory owners come up with: First, the media fixation with minimum wage is misleading, because workers only get minimum wage during the period of internship. Second, there are few a bad apples, a few bad owners, but the media paints the entire industry as being blood suckers. The bad apple theory is based on the assertion that since a single factory employs thousands of workers, when thousands of workers take to the streets, it could mean that the workers of only one factory are protesting. It is not an industry-wide condition. I could hear my friend yawn as he said, “there is always a politics of number.” Before hanging up, he told me about the factory owners favorite story – the story of women’s empowerment. Selim Newaz, owner of Texmark, says, “I find it surprising when people say we are exploiting our workers. They work because it is the best available option.” painting the empowerment story thus, “Thousands of women in their late teens and early 20′s are wearing cosmetics, carrying handbags and walking to work every day. They are empowered in a modest way.” (Star Magazine, March 19, 2010). This women’s empowerment story that factory owners’ celebrate comes with a cost. A cost that garment workers pay with their sweat and blood, with broken bodies and ill-health. I spoke to Laila Begum who worked in a garment factory for more than twenty years. She left her job when she became too ill to continue working. I had worked as a domestic help before, I prefer factory work to being a kaajer meye because even though the hours are long, work hours do end, and one does come home. But at the factory, she continued, there was the fear of ‘handcuffing.’ What is that? I asked. It is a way of monitoring your work, she explained. If you go to the toilet once too often, if your production is low, if you miss a day’s work, you will be `handcuffed.’ You will not be paid on pay day, instead, you have to wait till the end of the month for your pay. There are other stories too apa, she went on. There was one incident that is stuck in my mind, one which I will never forget, the day my co-worker was sexually harassed. She was young and new to Dhaka city. The manager called her up to his room and tried to molest her. Sexual harassment was not easily talked about those days. She had to leave the job silently. There were irregularities at the workfloor too. I wanted to work as a sweater machine operator. The machines are heavy and the manager insisted on hiring men only to operate the sweater machines. This meant that only men had access to better paid jobs. I was never a weak and skinny girl. I knew that if I was given the chance, I would have done better than the men. Some times we would not be paid Eid bonuses, they’d give us the rejected sweaters, shirts and trousers instead. There has been some improvement but when I hear from my niece that she and the other girls have to sign on a blank piece of paper, as a condition for getting employment, I feel bad. Laila has been suffering from kidney disease for the past 9 years. It was her deteriorating health condition which led her to give up her job. As a helper, I had to work in the factory, I had to stand on my feet, continuously, for more than eight hours a day. All the girls in my unit would withhold their urine for these long hours. We would not drink any water during the day, so that we didn’t have to go to the toilet. As Marx said, labour produces works of beauty, it enables the rich to purchase works of beauty, BMWs and so on. As for the labourers? Chicken’s feet, claws. Spent bodies. Broken bodies.